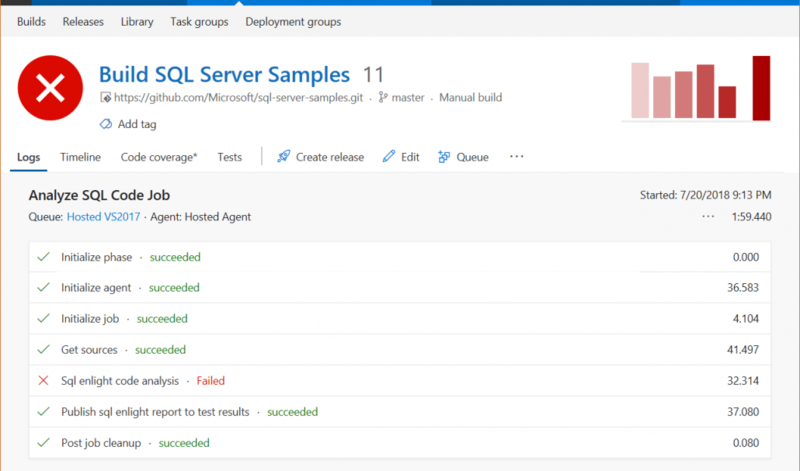 SQL Enlight Code Quality extension for Visual Studio Team Services and Team Foundation Server consists of build task can be added to the build definition. 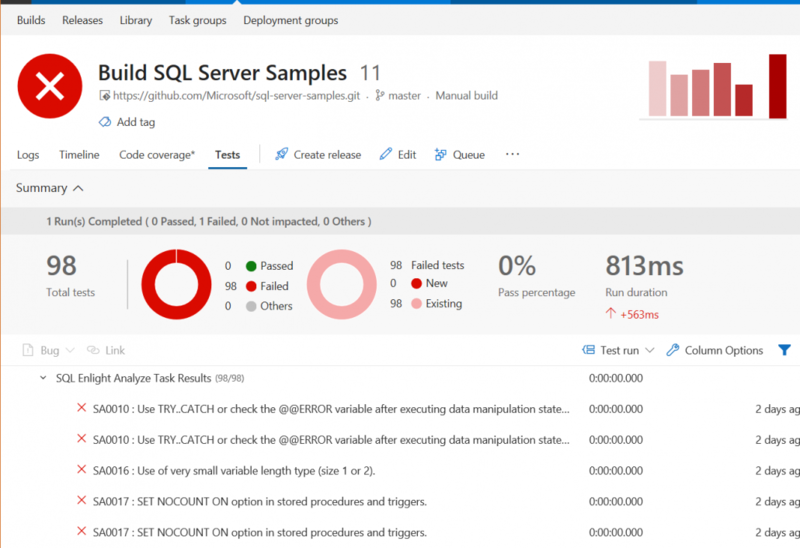 The task analyses T-SQL code against best practices and its output can be easily combined with the build test results. 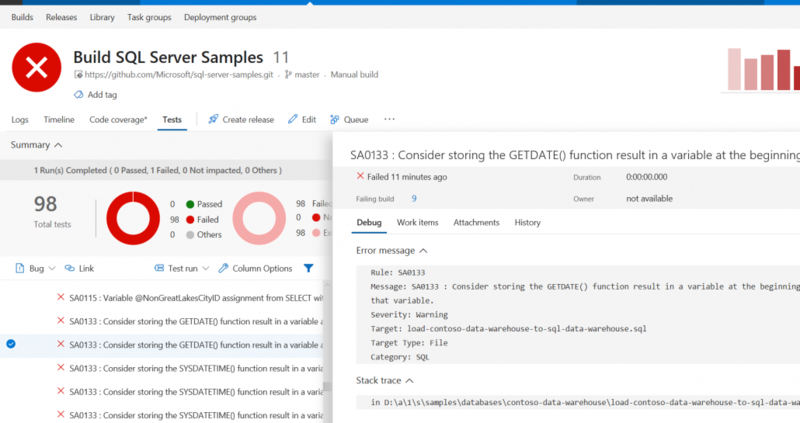 The build task uses more than 230 standard analysis rules, which to ensure code quality, detect potential defects and check against best practices. SQL Enlight supports creation of custom rules, which can be also used by the TFS/VSTS extension. 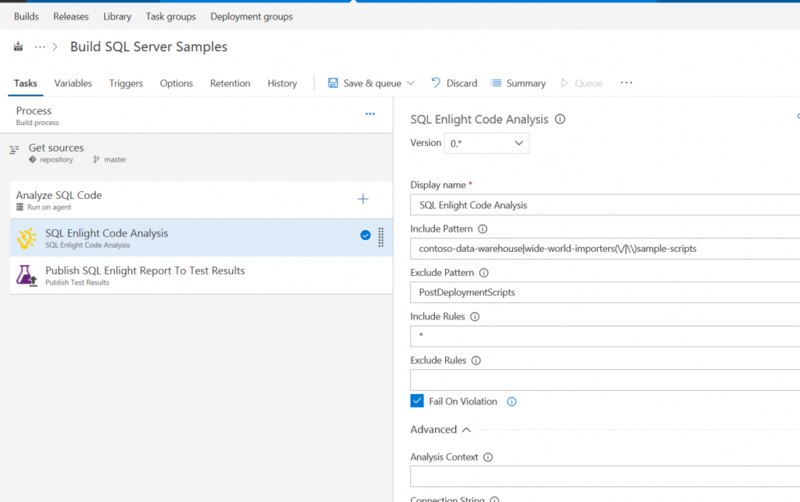 The SQL Enlight Code Quality extension is now in preview and is available for install in Visual Studio Marketplace. 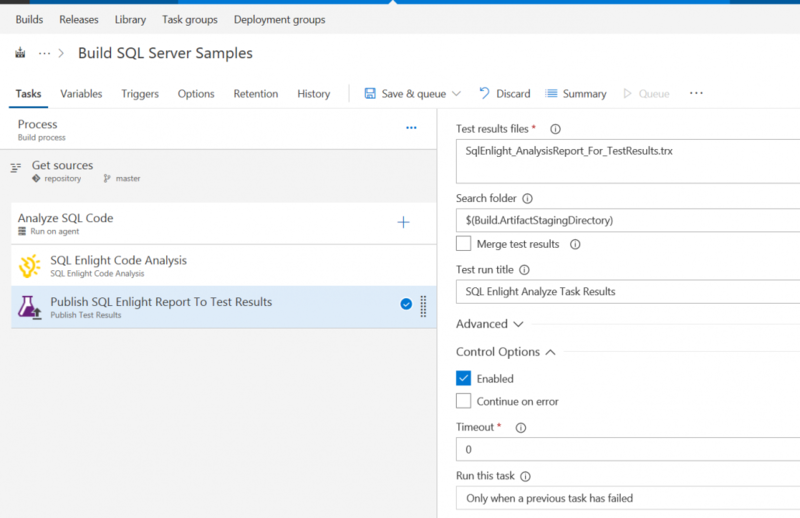 The SQL Enlight Code Analysis Task works together with the Publish Test Results task in order to combine code analysis results with the Test Results. 1. Find and add SQL Enlight Code Analysis build task. All the SQL Enlight Code Analysis settings are optional and are grouped in two categories – General and Advanced. Optional regex pattern for matching .SQL files, which to be analyzed. The pattern can be used to limit the analyzed files to specific folder. If provided only the files having path matching the regex pattern will be analyzed. If not provided, all files will be included by default. Optional regex pattern for matching .SQL files, which to be excluded during the analysis. The pattern can be used to exclude specific folders or files from the analysis. If provided only the only the files having path not matching the regex pattern will be analyzed. If not provided, there will not be any excluded files. Optional comma separated list of rules, or analysis groups which to be enabled during the analysis. By default, all active rules will be included. Optional comma separated list of rules, or analysis groups which to be disabled during the analysis. By default, there won’t be any excluded rules. The setting controls the build outcome in case any rule violations are found. It can be used to fail the build in case any analysis rule is violated. If enabled, the task will fail if any rule violation is found. If disabled, the violations will be added to test results, but the build won’t be forced to fail. Optional SQL connection string, which to be used for loading analysis context. Optional output file for the generated report. Optional custom properties, which to be provided to the generated report. Optional analysis template file, which to be used for the analysis. In order to publish the results only when SQL Enlight Code Analysis task has failed, set the Run this task to Only when a previous task has failed. The Log tab shows all results and whether the Code Analysis task has failed. If the Code Analysis task has failed, the Tests tab will contain a tree node SQL Enlight analysis results. All rule violations, which have severity Werning or Error are treated as errors and will appear in the Test Results. Opening each error will show details about the error and the file and line at which the error violation appeared.